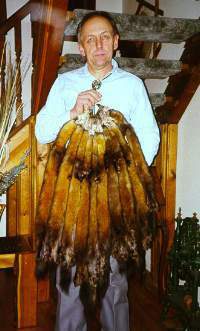 A few years ago a couple of trappers from Maine introduced me to a different way of catching marten. For years I had been using 120 Conibears in plastic flower pots nailed upside down on the trunk of a tree (see: American Trapper, Jan.-Feb. 1996, Vol. 36(1):32-41) and found the set to be very good for taking marten in southeast Alaska. The Maine trappers suggested I try newspaper boxes (known as "Motor Route Tubes" in the trade) as they have just the right-sized opening to hold a 120 Conibear with plenty of room behind the trap for bait. I didn't think about it anymore until I got home and walked out to get the evening paper. When I pulled the paper out I recalled the conversation. At that point I went straight to my trap shed, grabbed a 120 Conibear, and returned to our street side newspaper box. To my amazement, after I cut a couple of slots in the sides to accommodate the springs, the trap fit perfectly inside the opening. Although I don't use legholds for taking marten in southeast Alaska, I could see that the box would also accept a No.1 Longspring, the most commonly used marten trap in the state. The wife didn't particularly like those slots in the sides of her newspaper box so I had to go downtown and beg the company for a replacement. I promptly started telephoning for a source of the boxes. Eventually I ordered 40 boxes as they came in lots of 20. The company was running yellow plastic at the time (15 different colors are available) so when the boxes arrived I sprayed on several other colors to camouflage them. I don't think the color makes any difference to a marten, but since I leave my boxes out all year, I didn't want to draw any unnecessary attention to a highly visible object in the middle of the woods. I cut the side slots by drilling a 1-inch hole on each side 4 inches back from the opening. Then, using a scroll saw, I connected the hole with the front opening. I also drilled a ½-inch hole in the back to insert a bait tie wire, if necessary. These boxes came with metal mounting brackets, but I never used them as the bottom of the boxes have plenty of slots ideal for wiring the box to a pole, log or trunk of a tree. I use two pieces of trap wire to hold the box onto a horizontal or slightly angled pole held between two trees and, unless there is a convenient branch nearby, I attach the trap ring to one of these box wires so the marten hangs under the pole. I usually position the box about chest high so it is easy to insert the bait and trap and still allow enough height to keep the marten off the ground or above a foot or two of snow. They're very durable. If that plastic box can withstand years of abuse from snowplows and kids, it should be able to withstand many years of use on a trapline (providing a bear doesn't decide to tear it apart). They're light and stackable so you can carry a bunch up the trail in your pack, in your snowmachine sled or in the back of a pickup. They're reasonably priced. I paid about $3.00 each for mine but, considering the fact that they won't rust or rot and you don't have to spend the time building them, I think they will be worth the price over the long term. They can be set in a lot of different situations including vertically on the trunk of a tree, horizontally on a pole, or on the ground as a cubby for mink and marten. They can be used with a pan or wire trigger. Traps are easy to remove and reinsert after checking the bait. The bait compartment is large and the bait is well hidden to prevent detection by nontarget species like jays. Since a 120 Conibear fits so perfectly in the opening, the set is extremely efficient; when elevated off the ground, it is very selective for marten. To efficiently and selectively take marten, I think it is essential to use some type of container to protect the trap from the weather and to hide the bait from nontargets. There are many good containers used by trappers including plastic flower pots, wooden boxes, tin cans, etc. The important thing is to be able to keep the trap functioning under severe rain, ice and snow conditions and to keep the bait away from the inquisitive eyes of species you don't want to catch. This type of container serves those purposes very well. I believe this type of box would work well for a suite of species such as marten, mink and ermine if it is used at ground level, but by elevating the box several feet, mink are virtually eliminated from the set and ermine are strongly discouraged from climbing into the set. I still like pots nailed to the trunk of a tree but they are not nearly so versatile in a ground set. Also, flower pots placed vertically on the trunk of a tree may not be as efficient in catching marten as this box is when placed horizontally on a log or leaning pole. I devised a crude test this fall to see which set might be better at catching marten: 120 Conibears set in vertical flower pots or 120 Conibears set in horizontal newspaper boxes. Each set contained the same bait, was about the same distance off the ground, and occurred in similar habitat. Since the flower pots had already been established on my line for several years, I just alternated inserting the new boxes along the line. Although my sample size was small (10 animals) I did catch seven in the newspaper boxes and only three in the flower pots. I plan on continuing the experiment next year to see if that kind of catch ratio continues. This past year I used pan triggers in the boxes, but next year I am going to try the standard two-prong triggers that I have used in the flower pots for many years. Although all the marten I caught were perfectly double struck (in pots or in boxes), I don't think a marten can get past a correctly positioned two-prong trigger. However, it could step over the pan if set too low and then the marten would get struck too far back. It may also avoid entering the set altogether if the pan is set too high thereby blocking a large portion of the opening. Also, I am going to continue elevating the sets not only because I want to avoid catching mink, but I also want to avoid other problems associated with ground sets for marten in the area I trap. Heavy snowfall can regularly bury ground cubbies unless they are placed under the overhanging branches of large conifers or under the roots of large upturned trees. Even so, laying on your belly many times a day in 2-3 feet of wet snow looking for trapped animals or buried sets, is not my idea of fun. Also, trapped marten can freeze to the ground in this climate and cause additional problems in removing the animal. If marten are left for several days, even when frozen, mouse damage is almost inevitable. I will continue to use 120 Conibears in these sets, rather than leghold traps. Two marten I caught this year were killed so quickly that they never even struggled out of the box. Therefore, I am comfortable with the humane killing aspects of the set. In this climate, I rarely have a problem with animals frozen so hard into the trap that I can't get them out at the site without damaging the fur. However, this is often not the case in interior Alaska where animals taken on longlines remain in traps for extended periods with temperatures far colder than in southeast Alaska. In situations where it is virtually impossible to remove the animal from the trap at the site without damaging the pelt and the carcasses have to be transported many miles in a snowmachine sled, which eventually leads to damaged fur from the constant movement between traps and animals, it makes sense to use leghold traps. Leghold traps are easily removed from the leg at the site and reset without having to carry extra traps. In any event, I'm sure glad I talked to those Maine trappers. I think their idea of using newspaper boxes has a lot of merit, and I'm going to use them more in the future.